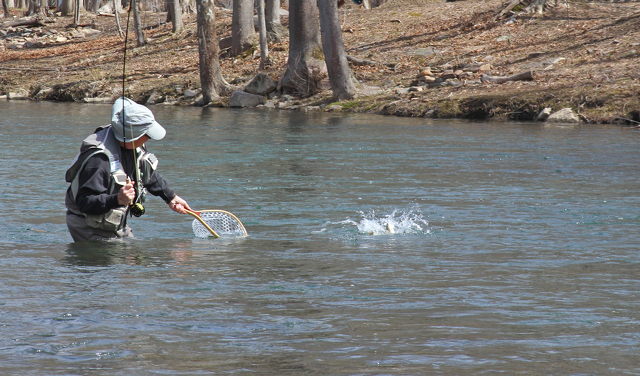 A fly fisherman lands a trout while fishing on the Little Juniata River. Centre County has a number of prestigious trout fishing streams that brings anglers to the area from all parts of the country. Saturday, April 13, is the day anticipated by many trout anglers. It is the opening day of trout fishing in 49 of Pennsylvania's 67 counties — including Centre and all adjacent counties. The Fish and Boat Commission's stocking trucks have been busy augmenting area streams with trout for the past six weeks. Statewide, the agency will stock approximately 3.2 million trout this year — a mixture of brooks, browns, rainbows and golden rainbows. The cooperative trout nurseries will add about another 1.2 million to the total. More than 700 streams and 127 lakes, dams and ponds are on the stocking list for 2019. A total of 15 Centre County streams, plus Cold Stream Dam, Poe Lake and the Seven Mountains Boy Scout Pond will be stocked by the commission. These stocked trout streams include all or parts of Bald Eagle, Big Poe, Marsh, Penns, Little Fishing, Black Moshannon, Pine, Sinking, South Fork Beech and White Deer creeks, Wallace, Eddie Lick, Wolf and Six Mile runs, as well as Mountain Branch. Three streams have yet to receive their pre-season stockings — lower Bald Eagle Creek (Milesburg to the inlet of Sayers Lake) and Wallace Run will get trout on April 11, and Six Mile Run will receive its planting of rainbow trout on April 12. Cooperative nurseries, such as The Three Point Sportsmen and the Bald Eagle Sportsmen, add trout to commission-stocked streams and stock a few additional waters. Centre County is also home to some of the best wild trout fishing in the state. Streams such as Penns Creek and Spring Creek are known throughout the country. Dozens of other streams are full of naturally-reproduced trout. There is no shortage of places to fish for trout in Centre County. Some say that the county is the center of the trout fishing universe. Anglers age 16 and older will need both a fishing license and a trout/salmon permit. A resident fishing license, including the issuing agent fee, costs $22.90, while a trout/salmon permit adds another $9.90. Non-resident licenses cost more and seniors 65 and older can purchase senior licenses at reduced cost. Licenses can be purchased online or in person at various sporting goods stores or departments. Youths age 15 and under can fish without a license. Unless otherwise specified in special regulations, trout season begins at 8 a.m., on Saturday, April 13, on all "Stocked Trout Waters." A complete list of these streams — arranged by county — can be found in the 2019 Pennsylvania Fishing Summary booklet. The booklet can be purchased from any license issuing agent for $3, or accessed for free at www.fishandboat.com. Trout must be seven inches or longer to be creeled. The daily limit is five trout of combined species. As long as you have not kept a limit of trout, anglers may practice catch-and-release fishing and continue to fish. New to trout fishing? What do you really need to catch a few trout? A rod and a reel spooled with monofilament fishing line, hooks, bait and something to clip your line with — that is it. Almost any rod and reel will work for bait fishing. One could easily spend hundreds, but less than $50 will do for starters. A 5- to 6.5-foot rod paired with an open-faced spinning reel would be a good choice. Starter sets can be had for $40 to $100. Four-pound-test monofilament line is a good choice for trout fishing. Size 8 hooks will perform well. Go online and learn how to tie a few simple fishing knots to attach a hook properly to the line. Learning to tie the improved clinch knot would be an excellent place to start. Granny knots will not do. You could purchase pre-tied (snelled) hooks, but then you would need to tie a snap swivel at the end of your line. Bait — If you have a small garden or even a leaf pile, you might be able to locate your own earthworms. Big or small, they all work fine. Other easy choices to purchase are salmon eggs (go with a light orange or natural color), mealworms, wax worms or Powerbait. If you fish with mealworms or wax worms, you should add a little weight to your line. One small split-shot sinker squeezed on your line about 12 inches above your hook will add enough weight for casting. These items are not absolutely necessary, but they will improve your fishing experience. Hipboots make it possible for you to get to better casting positions and enable you to wade into shallow water to retrieve a snagged hook. Polarized sunglasses protect your eyes and allow you to see into the water. Drab clothing helps to hide you from the fish, while small needle-nosed pliers make it easier remove hooks from fish and provide something to hold your extra bait, hooks and the trout that you might choose to keep. If you cannot get out on the 13th, you can still have an opportunity to fish for freshly stocked trout. The commission's Centre County in-season stocking begins with Penns and Pine creeks on April 15; Black Moshannon Creek, Cold Stream and Cold Stream Dam are scheduled to be stocked April 16. Big Poe Creek and Poe Lake will receive a release of trout on April 19. Details of sections stocked, meeting times and places can all be found on the agency's website.